Mingkee and Miriam are speaking at the #iPSB2018 - see twitter for regular updates. Fantastic venue for this plant systems biology meeting! Please take a look at the upcoming 1st international Plant Systems Biology conference, due to be held in Roscoff, France this September! Applications for attendance are open now! Miriam presented the work of the lab in synthetic biology, including plant cell type identify and the latest on nanodots, to an audience across research areas. Great science and an amazing location! Today is the annual Warwick Integrative Synthetic Biology centre review symposium - a chance to hear about all the science going on. Peter Morrison from our group will be presenting a poster on his work on nanodot delivery of small molecules to root cells. Miriam presented work from the lab in the 'Microbial Mechanisms of Plant Pathology' session as an invited speaker at the Society of Microbiology 2017 meeting in Edinburgh. Plans (and plants!) are underway for our next Science Evening: "Keeping plant disease at bay" Tues 7th Feb.
Well done to Tim Coker - latest from the Gifford lab to successfully defend his thesis! As part of a group from the Warwick Integrative Synthetic Biology centre and Life Sciences, Miriam visited reserach groups at the University of São Paulo, Brazil, to develop new co-funded projects. Postdoctoral research fellow - we seek an independently thinking and highly motivated candidate with expertise in both wet and dry bench experimental skills in the area of plant-microbe interactions, plant-soil or plant molecular development. See http://tinyurl.com/rootsWarwickPDRA for details. Senior research technician - we seek a highly motivated candidate with excellent organisation and communication skills, with expertise in plant-soil biology and large-scale biological experimentation. See http://tinyurl.com/rootsWarwickTech for details. 16 of the country’s best young biologists came to Warwick this week for the British Biology Olympiad finals; organised by the Royal Society of Biology and sponsored by BBSRC. Miriam was involved in designing and teaching practicals on plant morphology, taxonomy and physiology. Their skills were assessed the following day with an exam in the lab - see below! We are officially launching the Warwick Integrative Synthetic Biology Centre today: industry showcase today and scientific theme discussions tomorrow! Great visit to LIPM (Toulouse) last Friday - discussions on Medicago genomics, systems biology and genetic regulation of nodulation. Looking forward to future collaborations and joint PhD projects. Miriam presented lab data and tools (cell sorting and the Medicago IDEAS multinetwork) at the JIC Legume Symposium (27-28 Aug). Welcome to Matt Teft who has started his MIBTP mini-project (and PhD thereafter) in the group! Matt is fresh from helping to run Warwick's Cheltenham Science Festival marquee in June. This was part of his MIBTP Professional Internship for PhD students, and you can read his blog all about it here. Preparing for June conferences! Bea will be presenting a poster at the SEB meeting in Prague (30 June-3 July) and Miriam will be discussing colllecting and managing plant data at the COPO workshop at TGAC Norwich (23-24 June). Reports to follow soon after. Beatriz and Miriam were both able to discuss our work with the Plant Science and SLCU groups there, and we are looking forward to returning soon. We had a very productive time at UK PlantSci last week - see pictures below of our poster presentations. Talks and posters will be online soon. Welcome to Mingkee Achom who started in the lab today! Mingkee is a Chancellor's Scholarship-funded MIBTP student who will carry out her PhD in the Gifford lab, working on regulation of nodulation by microRNAs. Many congratulations to Roxanna Bonyadi Pour who has passed her PhD viva with minor corrections today! Miriam is giving a talk at the Royal Agricultural University's International Rural Development Seminar today - there is a wide mixture of talks from industry and academics with an audience of end users, seed breeders and RAU postgraduate students who have orgaised the day. Welcome to Matt Jackson who started in te lab today! Matt is an MIBTP student who will carry out his PhD with George Bassell in Birmingham on plant shape regulation. He will spend the next three months with us as a mini-project, working on self-organisation of cell types. 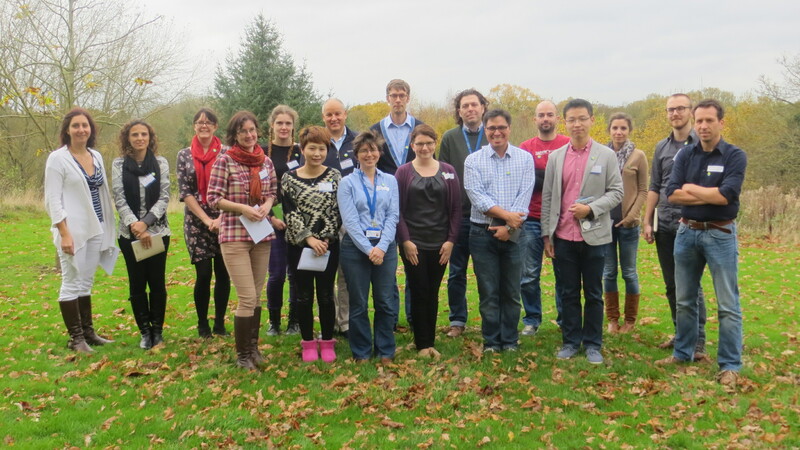 We were excited to be co-organising a New Phytologist workshop 'Developing interdisciplinary omics tools for organelle and cell type–specific analysis of plants' at Warwick to share our methods and discuss technique advances to enable single cell type and organelle proteomics. 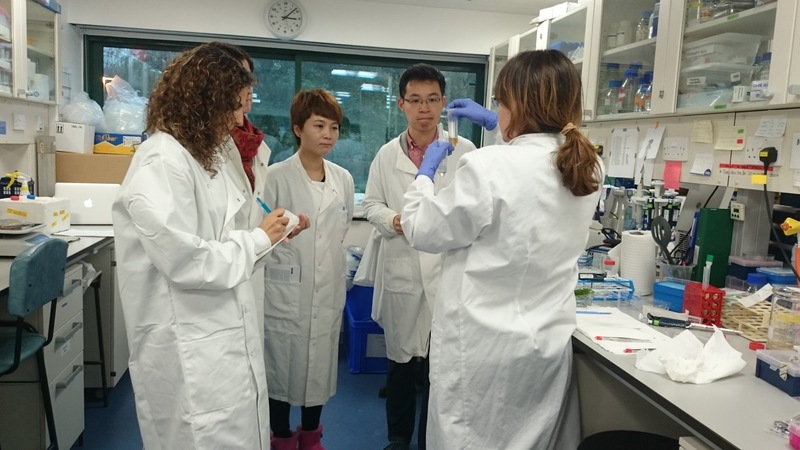 In a lab carousel they experienced protoplast generation, cell sorting, imaging and toured our recently refurbished (with new equipment too) WPH Proteomics Facility. And Beatriz also presenting her poster .... and enjoying GARNet cupcakes! The aim is to communicate science and some of our research to a wide audience! Animals and plants are made up of many different cells that have to work together to enable living things to grow and develop. This means that cells have to talk to each other. Even the cells in a slime mould talk to each other! The lecture will be very interactive, with the audience playing ping pong and communication games to give them a cell’s eye view of trying to make themselves heard! We have a 12 month BBSRC funded bioinformatics PDRA post in our lab. For full details please see the job spec. The closing date is 14th August 2014. The lab is back from an excellent SEB meeting in Manchester (1-4 July 2014)! Miriam was co-organiser with Malcolm Bennett (Nottingham University) for the three day session 'Roots for Global Food Security' which covered all aspects of root-evironment interactions and was a tribute to the career of Bill Davies (Lancaster University) whose legacy on the field was palpable. Tim and Beatriz both presented posters: see Tim below, discussing his work on the cell specificity of plant-pathogen interactions. Also see @giffordlab for the highlights of the session. Just back from São Paulo - Miriam participated in the Transatlantic Partnership Workshop on Synthetic Biology - a BBSRC workshop bringing together researchers from Warwick Life Sciences and Warwick's Synthetic Biology Centre WISB, University of São Paulo's BSSB Biomass Systems and Synthetic Biology centre and the University of Boston's CoSBi centre. Miriam will be giving at talk in Warwick's department of Computer Science on the 6th of March: 'Defining the scope of developmental plasticity using cell type specific profiling'. This is a joint session with Dr. Alex Jones and Dr. Patrick Schafer where we are introducting our biological research to generate interest in collaborations between our departments. Welcome to Beatriz Lagunas who has started and is already busy in the lab with her new project (transcriptional regulation and cell-cell communcation during nodulation). Congratulations to Anthony Carter (PhD) and Tim Coker (MSc with Distinction) who graduated from Warwick in the winter ceremony today! Also to Alumnus Will Macnair (MSc with Distinction)! We have just hired a new technician, Dr. Beatriz Lagunas (coming from CSIC, Zaragoza, Spain) and she will join the lab in February 2014. The lab is hiring for a one year tecnical position to work on cell sorting BBSRC project: post details and application info. Miriam Gifford is an invited departmental speaker at the Institut des Sciences du Vegetal (ISV-CNRS) near Paris on Friday 10th October. PLOS Genetics paper just accepted on the natural variation in nitrogen responses in Arabidopsis..copy available soon. Anthony Carter has passed his PhD viva with minor corrections, examined by Dr. Patrick Schafer (Warwick) and Prof. Sean May (NASC/Nottingham). Well done, the first PhD graduate of the lab! Welcome to Bethany Richmond who starts her MIBTP mini project (2nd April 2019) ... then on to her PhD research! WATCH our JOVE cell sorting video!